A couple of months ago all kinds of local cabbages, cauliflower and broccoli were available. The different colors of cauliflower alone was very impressive from white to green to orange and purple. I started thinking about one dish that can combine lots of these varieties in various preparation. This delicious and satisfying vegetarian dish is the result of about 2 weeks worth of research, prep, cutting and dicing, pureeing, roasting and sous vide-ing. With all the various cabbages in here what else to call it but Brassicas. Brassicas refers to the genus to which cabbage belongs and that includes plants like cauliflower, broccoli, turnips and mustard. They are hearty veggies that stand up to various cooking methods and robust flavors. 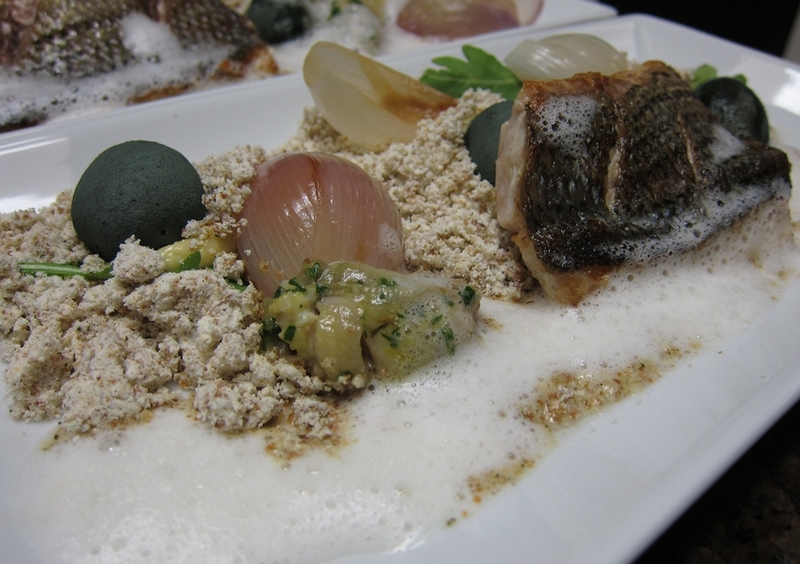 Here we have a base of cauliflower aligot, cauliflower florets with vadouvan, seared Romanesco, kohlarbi cones filled with cauliflower puree and the plate is topped with a crispy crunchy dose of onion and breadcrumb “soil”. Aligot is a French potato preparation from L’Aubrac region made by mashing potatoes and blending them with copious amounts of cheese. How could that be bad. Right? This dish is over all very light and I wanted the base to be substantial enough to make it more than a fancy salad. It’s a dinner plate after all. For this version, I blended 400 gr each of sous vide cooked cauliflower (bagged with butter) and boiled potatoes that were cooked with garlic cloves. I added cream to loosen it up a bit and the cheese. Certainly not traditional but I opted for a nice smoked Swiss cheese to give the mixture more of an edge that can stand up to the strong flavors of the the vegetables. It was so delicious that I could eat it all on its own with a spoon! In the Eleven Madison Park cookbook there is a recipe that is just cauliflower in many variations and it is definitely an inspiration for this dish. 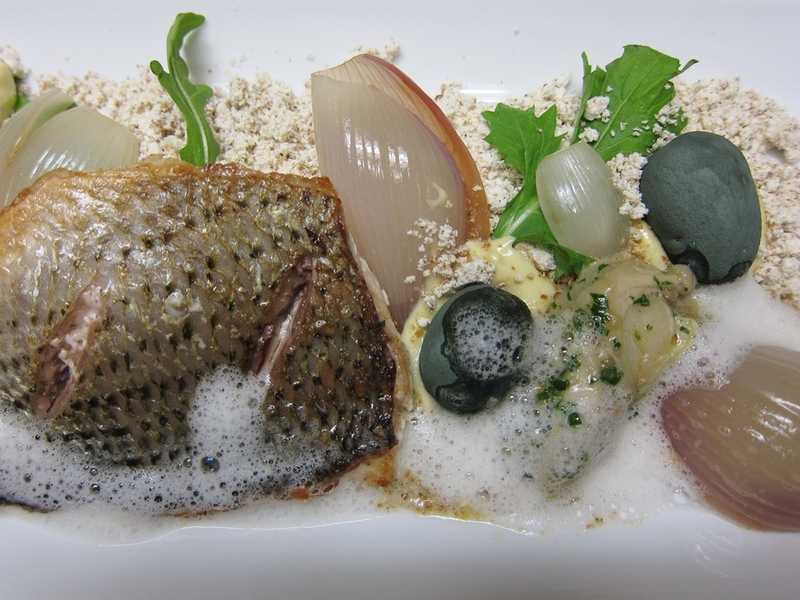 I borrowed a couple of ideas from that recipe including the puree and the sous vide cauliflower florets. I cooked the cauliflower sous vide with butter and vadouvan spice until very tender. I used mostly broken up florets and stem pieces for this saving the neater florets for another part of the recipe. To finish the puree I blended the cauliflower with whole milk and very little potato to hold it together. I put that in a squeeze bottle and kept it warm. For the cauliflower florets, both white and orange, I left some whole and the others (an idea from EMP again) I cut into neat disks. These also were cooked sous vide with some butter and salt. For the crunch element I cooked onions down in oil, similar to what i did for this Alinea recipe, until deep brown and almost burnt. I tossed these with salt and darkly toasted sourdough bread crumbs. This made for a fantastic sharp and crunchy element. When I added a couple heads of cauliflower to my order from Yonder Way Farm I was thinking I’d get a purple one maybe…or one of those green ones. Instead what I got was some very cool Romanesco. These are like broccoli crossed with cauliflower and then shot through with some alien DNA. Very neat looking. I cut those into wedges, rubbed them with oil and seared them very well to get a good caramelized flavor. I roasted them until they were cooked through but retained some crunch. Kohlrabi is another of those weird looking plants that we usually just pass by at the store and just barely give a second thought. These guys are delicious with a texture like jicama crossed with a turnip. Sliced paper thin on a madoline they can be salted and marinated with lemon juice or vinegar. They make for an awesome quick salad like that. They also become very flexible and can be used as a cool “wrapper” of sorts. It made perfect sense to make little cones out of them and fill that with the puree. After all the chopping and trimming I had a decent bit of cauliflower in random pieces. To use them up I borrowed another idea from EMP and made cauliflower couscous. Cauliflower is a very sturdy vegetable that can be easily pulsed in a processor until it’s the texture of bread crumbs or…couscous. I did not season these at all for this dish or cook them, but I can see how quickly sauteing them with butter, seasoning them with a bit of vinegar and topping them with a few scallops or shrimp would make for a delicious light dinner. Not to waste anything I wanted to use the cauliflower leaves too. These local heads of cauliflower and the Romanesco came cocooned in thick deep green leaves. I blanched those and shocked them in ice water. To serve them I warmed them in a mixture of butter and water and then seasoned them with walnut oil, salt and homemade beer vinegar. 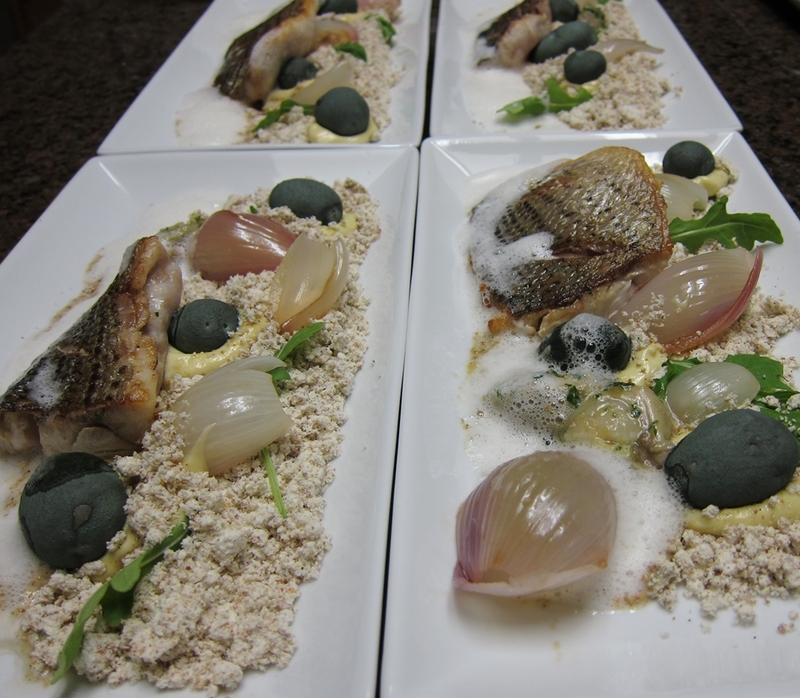 This was a first attempt to cook a recipe from Noma as closely as possible to how it’s written in the book. 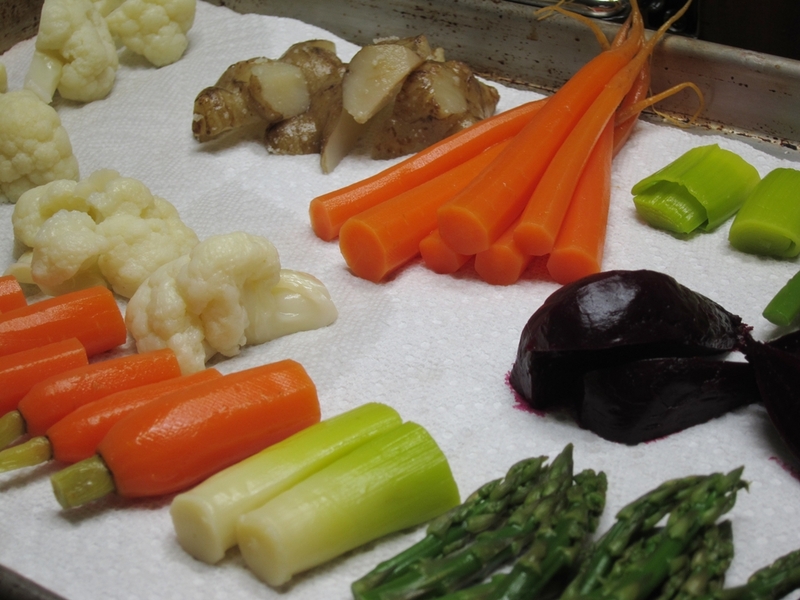 I made a sort-of Noma recipe before and loved the focus on the vegetables. They are cooked perfectly and presented simply. This particular recipe caught my attention from the first time I flipped through the book. It’s little more than a selection of vegetables and a base of mashed potatoes (and soil). 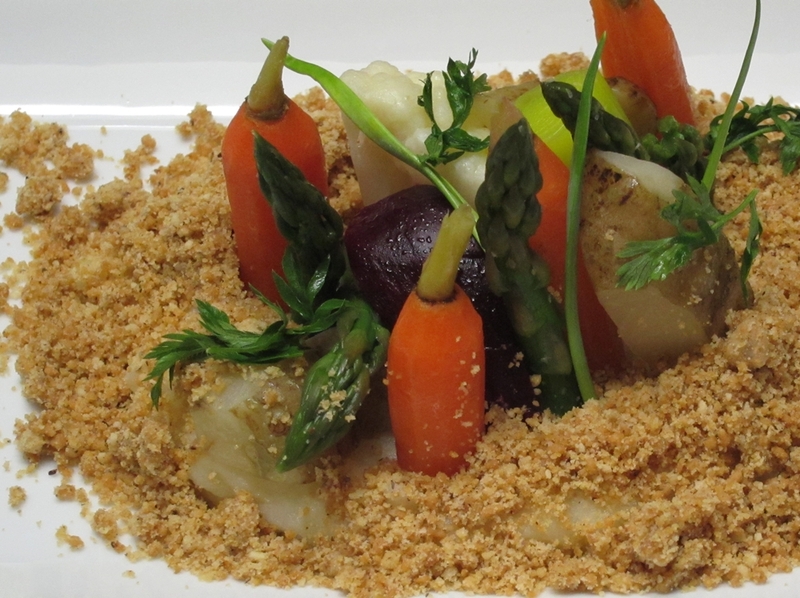 Nothing too weird or difficult, except the final dish looks like a small vegetable garden complete with soil and all. 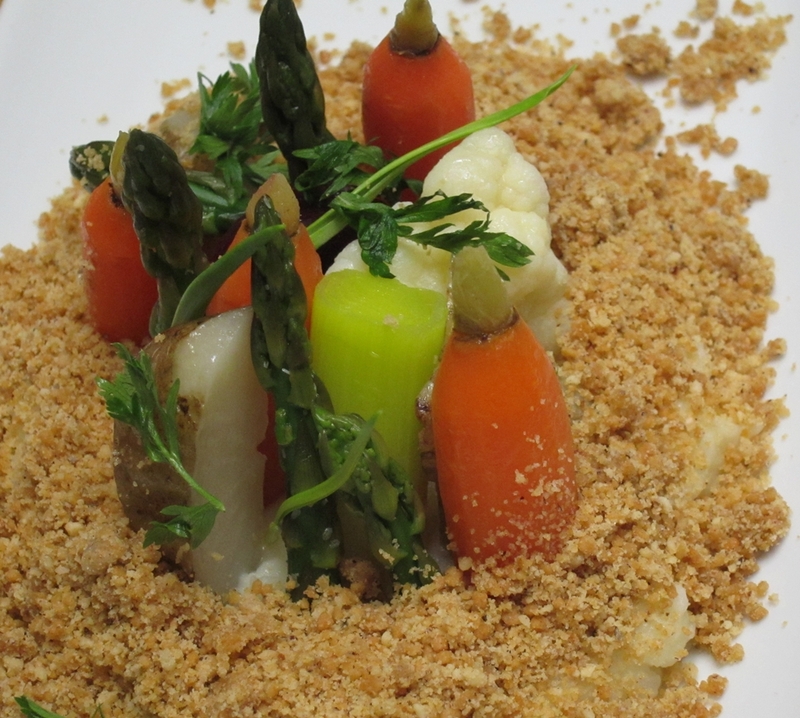 I would love to serve this dish with small rabbit chops along side the vegetables…bunnies in the garden. Sunchokes (aka Jerusalem Artichokes) – Cooked sous vide with butter at 85 C for about 1.5 hours. They retained a nice firm texture while fully cooked. 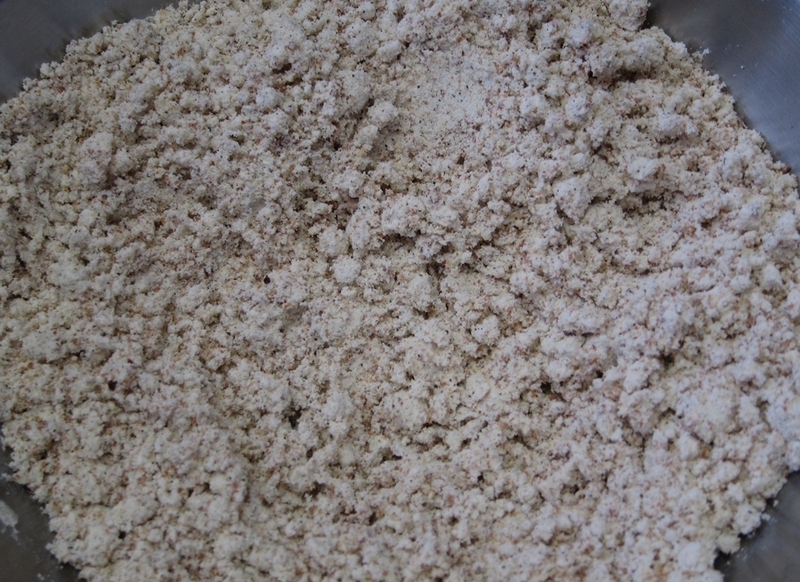 The soil component of the dish is made from ground hazelnuts, flour, beer, malt flour and butter. It is seasoned with salt and sugar. The soil is made in two “installments” over a period of two days. 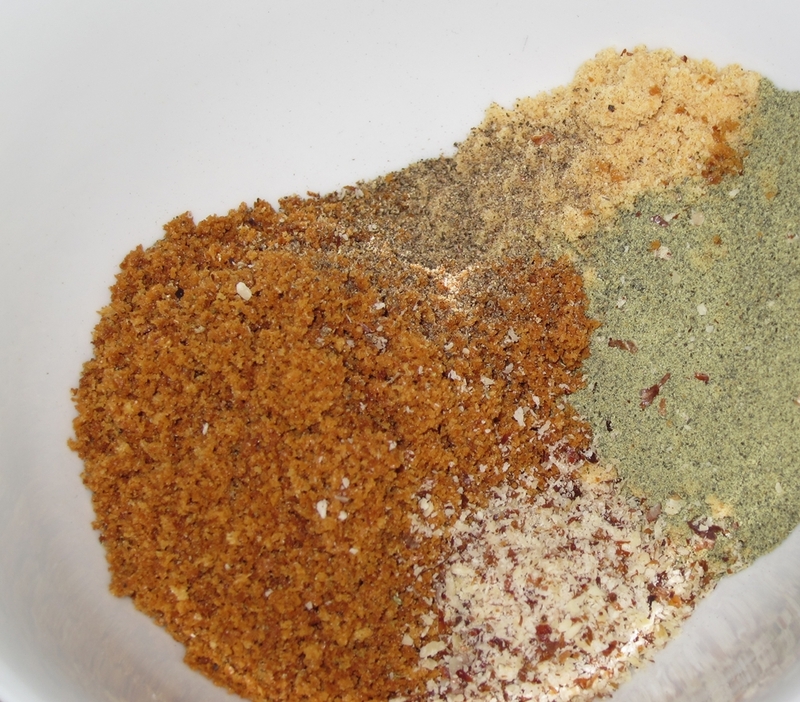 Ingredients are mixed in, dried in the oven for hours and crumbled. The next day another set of ingredients goes through the same treatment before the two get combined. 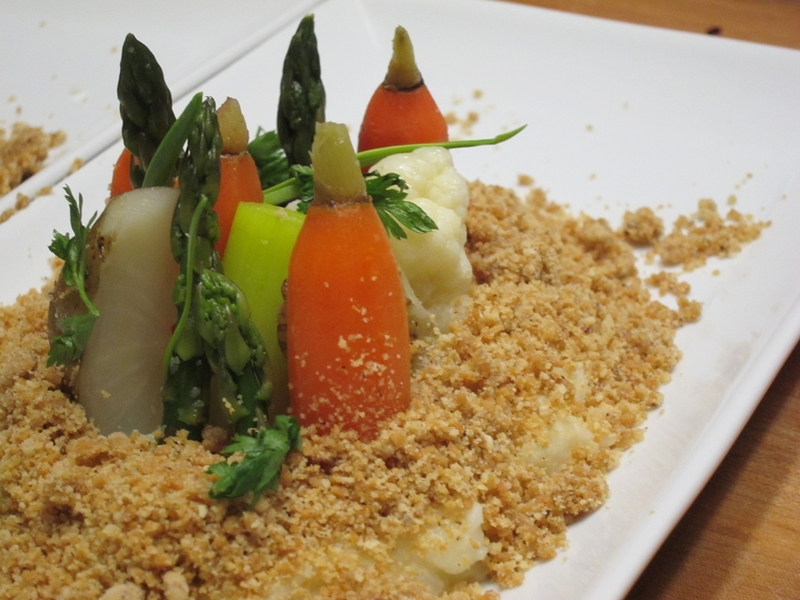 The idea is that the end result should look like dark rich soil and have a nice crunchy texture to complement the soft vegetables and the mashed potatoes. My soil did have that nice texture and very deep and rich taste, but unlike the recipe picture in the book it is much lighter in color. It looks more like sand than soil I guess. That malt flour might be the reason why the color was off. I could not find it anywhere and resorted to using a mixture of flour and malt powder. 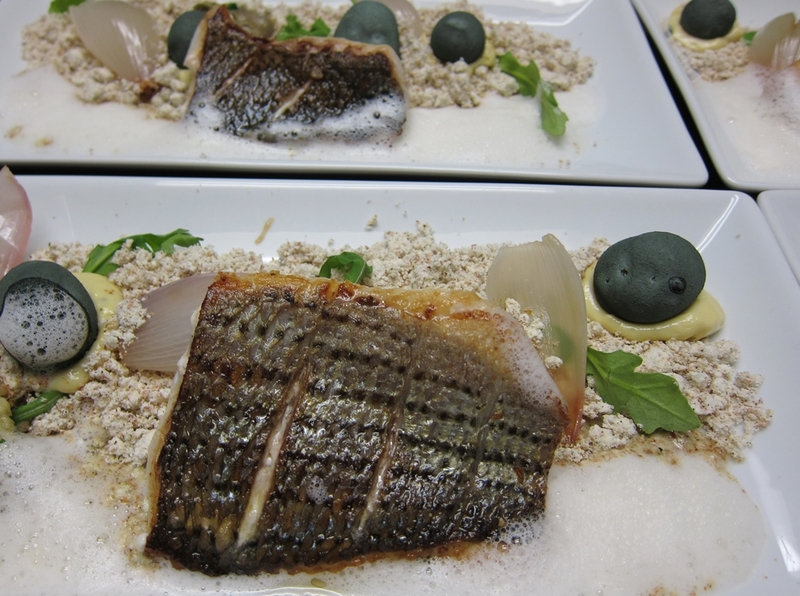 The last component is a straightforward potato puree flavored with horseradish and enriched with butter and cream. The quantity in the book for the potato puree is a bit too small so I just tripled it. To plate, the mashed potatoes go in first as a base. After heating the vegetables in a butter-water emulsion, they get “planted” in the potatoes and the soil covers the whole thing up. For a garnish, I used carrot-top leaves, garlic shoots and parsley leaves. This was a delicious, satisfying and beautiful plate of food.